Are you constantly looking for more ways to get your greens in? I know we are! While there are lots of ways you can sneak more greens into your day, they don’t always sound delicious or fun. 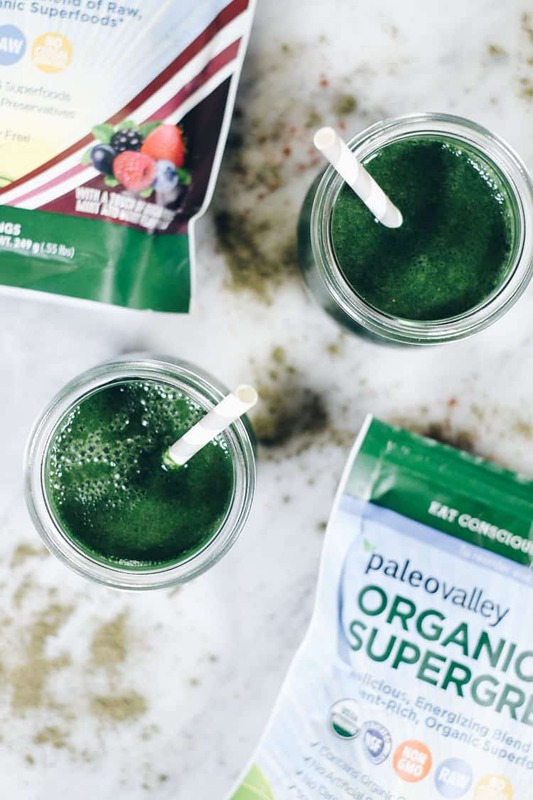 So, today we are going to share our new favorite hack – Paleovalley Organic Supergreens and 3 easy ways to use them! Ever since going Paleo, something I’ve wanted but had trouble finding was a green powder. While some of them out there are pretty clean in terms of their ingredients, it is really hard to find something that does not contain cereal grasses, which you are probably also trying to avoid if you’re grain-free and Paleo like us. Then, we found Paleovalley’s Organic Supergreens! They are a delicious, nutritious and energizing blend of 19 certified organic, raw, antioxidant-rich, health-promoting superfoods that blend easily, and it is super refreshing. All with zero cereal grasses! Here is a snapshot of what you get with the Organic Supergreens product we’ve been using. 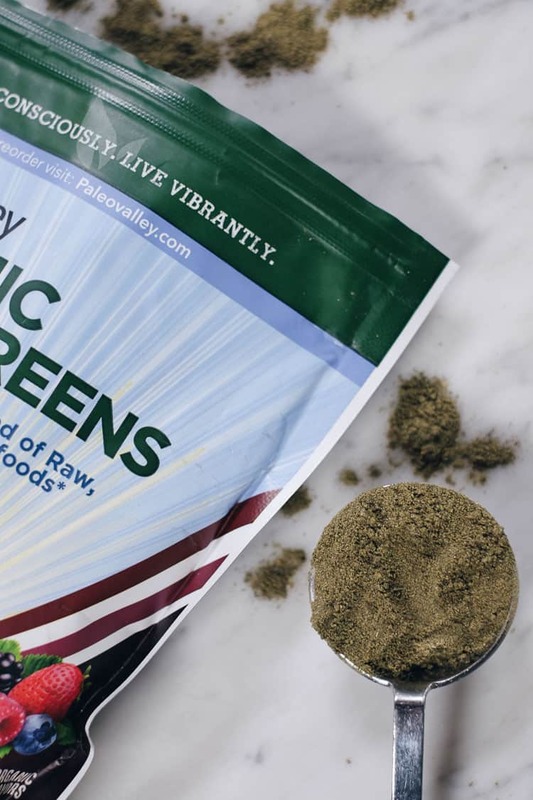 Ok, I really can’t even list ALL of the superfoods included in this Organic Supergreens blend, but just to name a few of my personal favorites here are some of the goodies packed into this easy-to-use mix. Organic Spirulina – A micro-algae that is 60% protein by weight and contains all essential amino acids. Spirulina is loaded with iron and vitamin K as well as other pigments with antioxidant properties. Organic Sea Kelp – A sea vegetable with a diverse nutrient profile. It is an excellent source of iodine and has been shown to be a potent anti-inflammatory, improve blood glucose levels, and slow cancer growth. Aloe Vera – Antioxidant and phytochemical rich powerhouses. High in potassium and vitamin C and may lower your risk of heart disease and cancer. They also have wonderful anti-inflammatory properties. Organic Reishi Mushroom – Research has shown reishi to promote longevity by boosting immune system function, promote liver cell regeneration, and have neuroprotective properties. Organic Ginger – Loaded with nutrients and bioactive compounds that have powerful benefits. Known to help stabilize blood sugar, fight inflammation, improve digestion and more. Organic Turmeric – Quite possibly the most powerful, natural, anti-inflammatory food on earth. And so many more superfoods and antioxidants! And It Tastes Good, Plus A Discount! 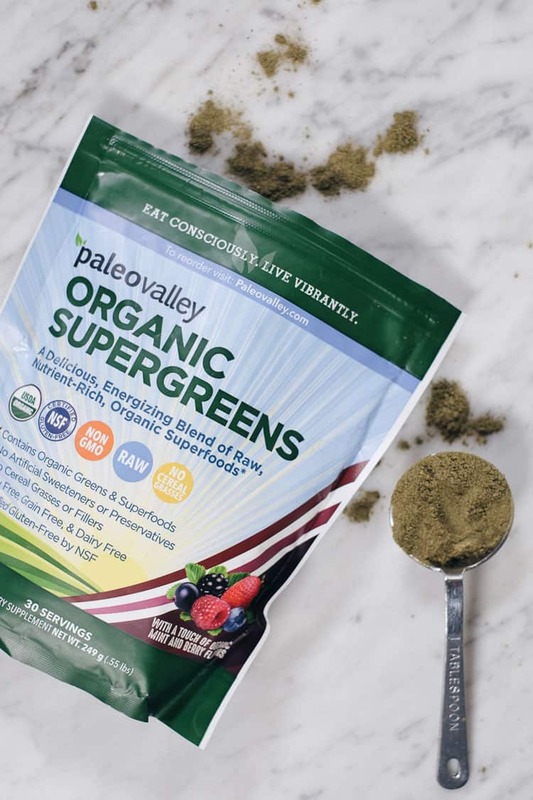 Not only is Paleovalley’s Organic Supergreens powder full of health benefits, it also actually tastes good! Like good enough you can really drink it simply mixed with water. Seriously. But before we get further into the taste and some recipes, you must be itching to get your hands on some of these Organic Supergreens right!?! Paleovalley has offered our readers a special 30% off discount for a limited time, so jump on over to their site and order some today! Just use the code realsimplegood at checkout to get 30% off of your order. The code expires December 31st, so hurry and stock up today to get some delicious, nutrient filled Organic Supergreens! They’d be a great addition to your healthy plans for 2018! 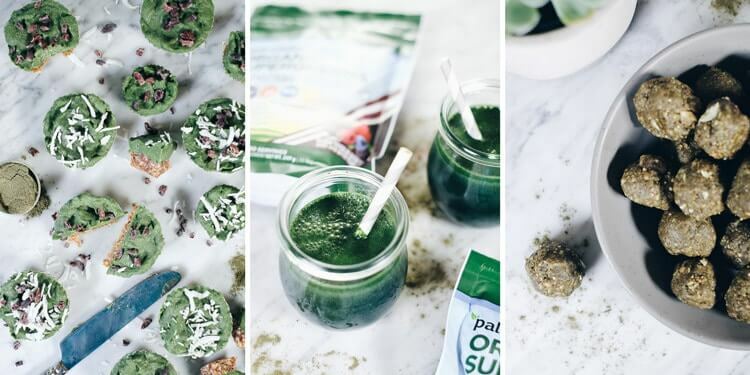 AND…here are 3 ways to sneak more greens into your day with them! Below are 3 ways to utilize and enjoy these Organic Supergreens! Sometimes this is a good idea and other times green powders don’t end up tasting too good in just water. This is a green powder you can REALLY just mix into water and enjoy! Seriously. It almost has a fruity, minty, green tea flavor, which makes this the first and easiest way to sneak more greens into your day. Our recommendation is to mix it into hot water and drink it like a tea. We like to blend it up in our Vitamix so it gets a little frothy and latte like. I’ve read that drinking warm water helps aid digestion so your body can absorb and utilize the nutrients. I also just tend to crave warm beverages. Give it a try, and let us know what you think! This might just become your new favorite morning routine! Because who doesn’t love a bite (or two-bite) sized mound of goodness?! 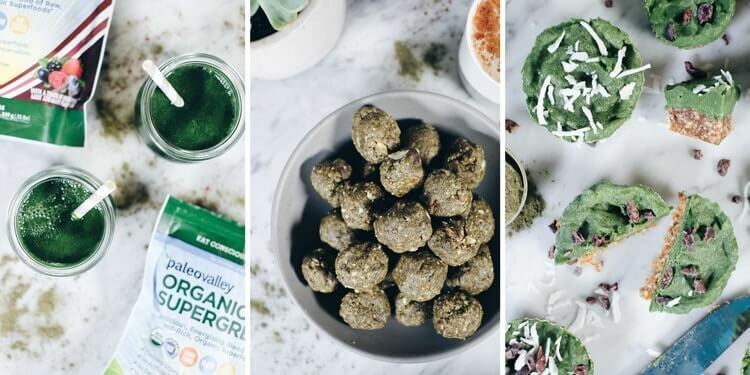 These Supergreen Energy Balls are our second way to sneak more greens into your day. We always love quick and easy bites we can take on-the-go or grab-and-go for a little afternoon pick me up. These guys are the best! 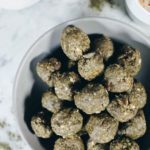 They’re made with healthy nuts, almond butter, coconut and Organic Supergreens and sweetened with dates. Plus, they are no-bake which is always a good idea! 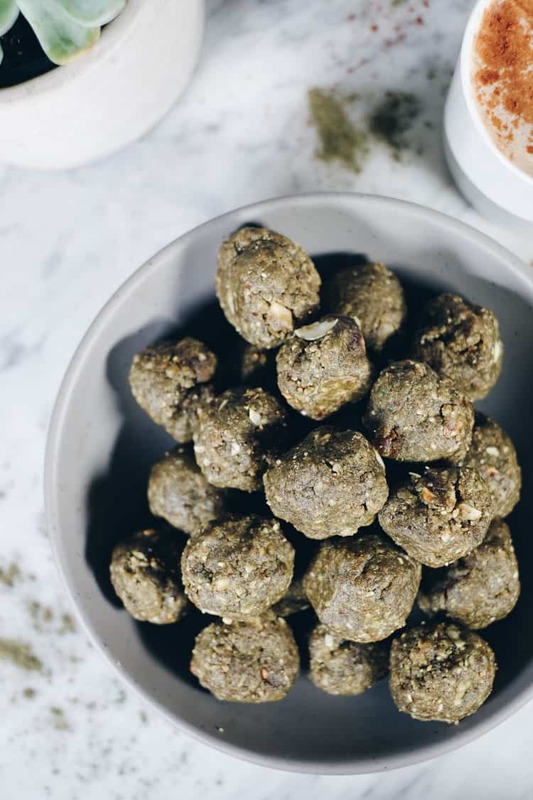 These easy, no-bake Supergreen Energy Balls are the perfect ball of fuel to help you sneak more greens! Place all of the ingredients in a food processor. Pulse until ingredients are combined and grainy. Stop the processor and scrape the sides down. Start the food processor again and run continuously until the mixture starts to form into a ball. You may need to stop and scrape the sides down again a couple times. Once the mixture balls up, stop the food processor and carefully remove the blade. Roll tablespoon sized amounts into balls and place in a glass dish. If the mixture is still a little grainy, you may have to pat the balls into shape versus rolling, but they will firm up in the fridge. Once all of the mixture is rolled into balls, cover and store in the fridge to have on hand for snacks. Our third way to utilize Paleovalley’s Organic Supergreens and sneak more greens in is with these easy, no-bake tarts. 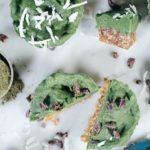 They’re like a little mini cheesecake, but with nutrient dense Supergreens and healthy fats from avocado. They’re sweetened with maple syrup, so there are no refined sugars and they’re super easy to make! Plus, they look pretty cool too! You can top them with whatever sounds good to you. We like shredded coconut and cacao nibs, but you could do some chopped nuts, fresh fruit, chocolate chips, etc. There are endless options. 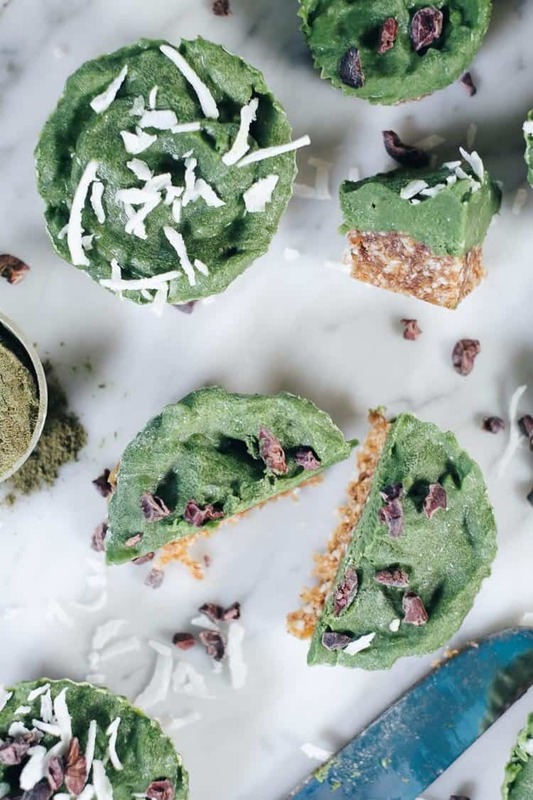 These no-bake Supergreen Tarts are a healthy treat to enjoy and sneak more greens! Place all of the crust ingredients in a food processor and process continuously until the mixture is grainy and sticks together. Wipe out the food processor with a paper towel. Then, place all of the filling ingredients inside. Pulse until all of the ingredients are smooth and creamy. You may need to stop and scrape the sides down a couple times. Spoon out the filling into each liner and spread it out with the back of the spoon. Add desired toppings, and place in the freezer to set for at least an hour. Once set, remove from liners and store in a freezer-safe airtight container in the freezer. There you have it! 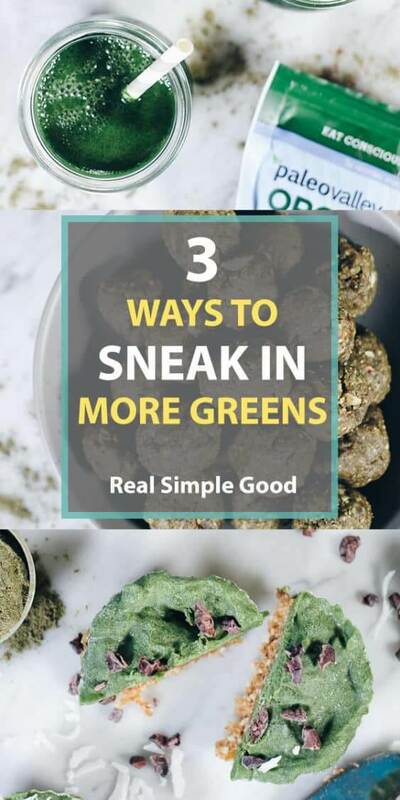 That’s 3 ways to sneak more greens into your day! Let us know what you think by leaving a comment below. Also, take some photos and tag us on Instagram @realsimplegood and @paleovalley, so we can check it out!